This is the Internet. We love cats, here. Sure, they may be downright a-holes a lot of the time, but you have to admit that they’re very, very cute a-holes. Whether they’re licking you with their sandpaper tongues, ramming you with their foreheads, or knocking every single thing off your desk, they’re pretty darn endearing. You can’t even really stay mad at them because at least they know what they want and aren’t afraid to do anything to get it. That’s admirable! If you’re a cat person, I don’t need to convince you that cats are great. But if you’re not a cat person, I have just the thing for you. 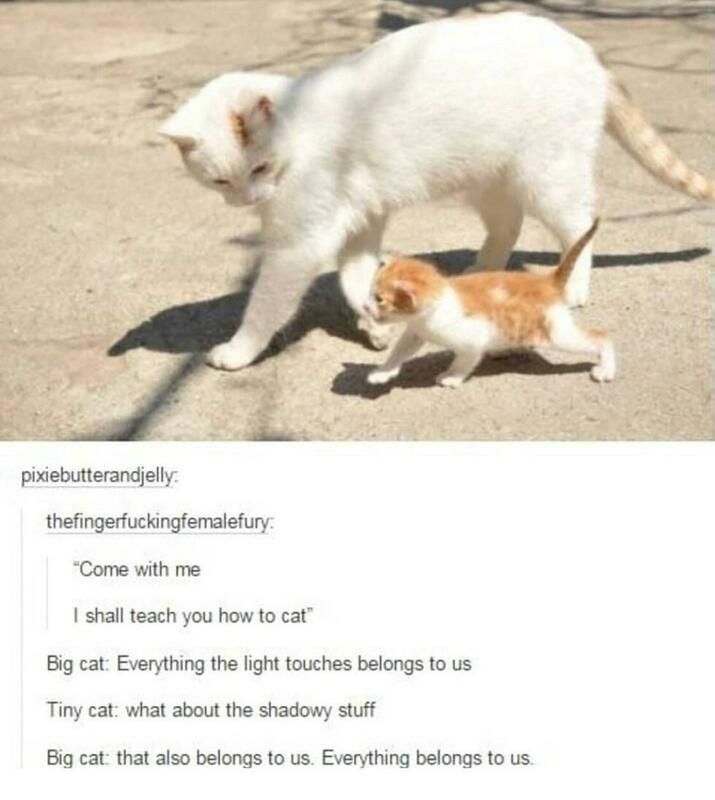 The people of Tumblr have made countless posts all about cats that communicate truths beyond anything I could tell you in a couple paragraphs. Anyway, I hope you’re ready to become a cat person! Maybe just a tad dramatic. 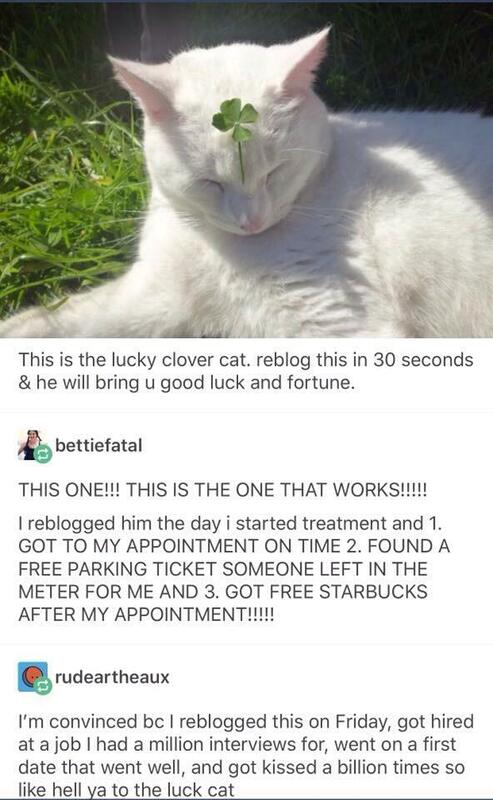 Look, I’m not saying the clover cat is definitely lucky. But I have been having a pretty great day ever since I first saw this picture. Maybe it’ll work for you too! One treat?! 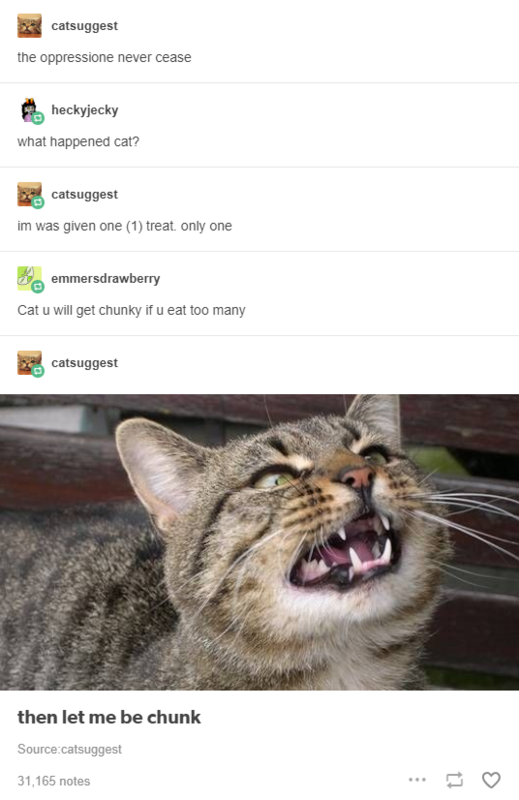 How is any cat supposed to live with only a single treat? It’s true. 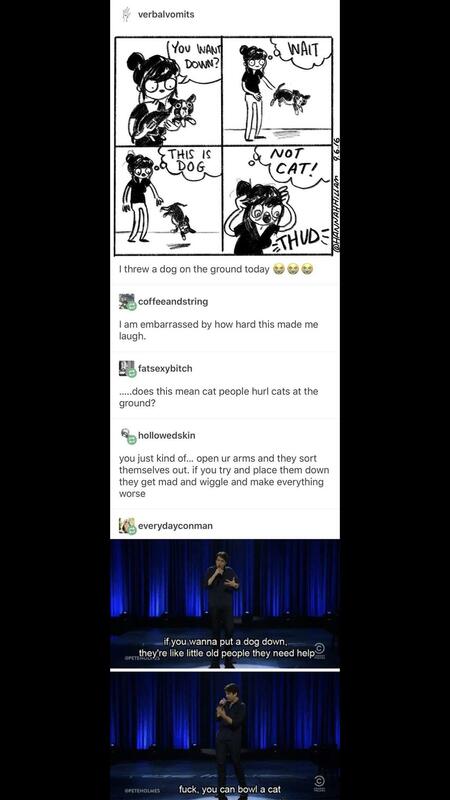 Dogs have to be lowered to the ground with the utmost care. Them: Oooh, what kind of cat is that? Me: I don’t know. A brown sort of gremlin? I got him from a Dumpster. Don’t even let anyone tell you how to live your life, cat. You are clearly doing a great job. One of these things is not quite like the others. I’d probably stay away from that one, actually. If I had to guess, I’d say that this cat’s owner is excited about their butter/hot dog sandwich. 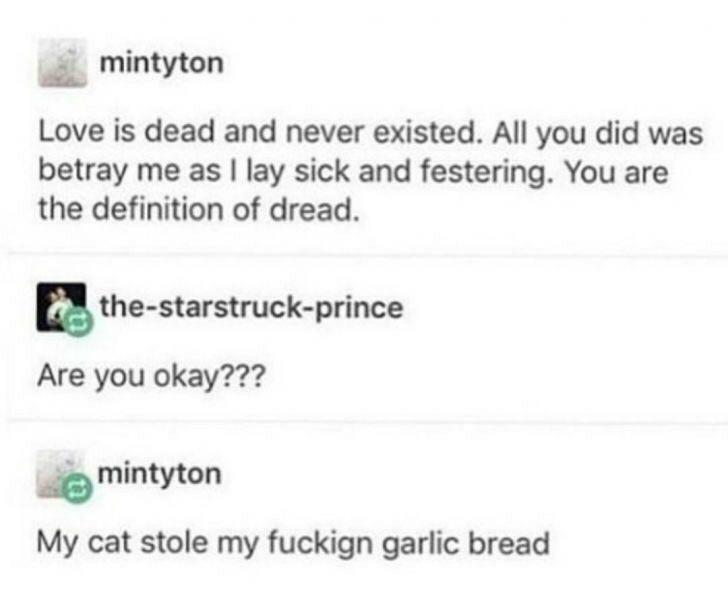 That’s the only reason the cat wants it. It looks like your cat may be malfunctioning. You’ve really messed up this time. This cat will not forgive. And he will not forget. I know exactly where we are! Now, hand me the map. 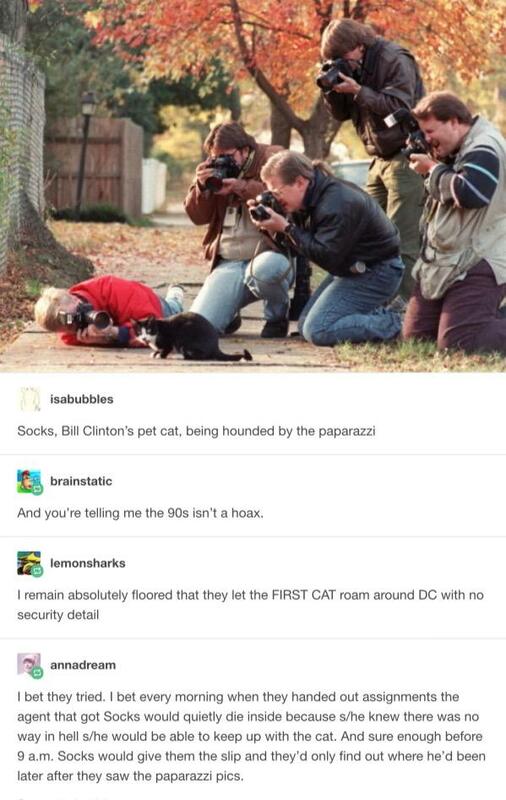 Although his owners were at times plagued by scandal, you know Socks was living his best life as First Cat. You’ve gotta see this great new trick I’ve learned. 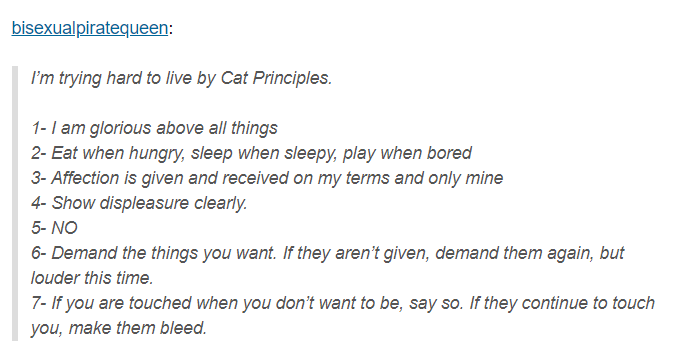 Yeah, your cat may secretly love you. But that’s not going to stop her from regarding you with disdain about 99.97 percent of the time. 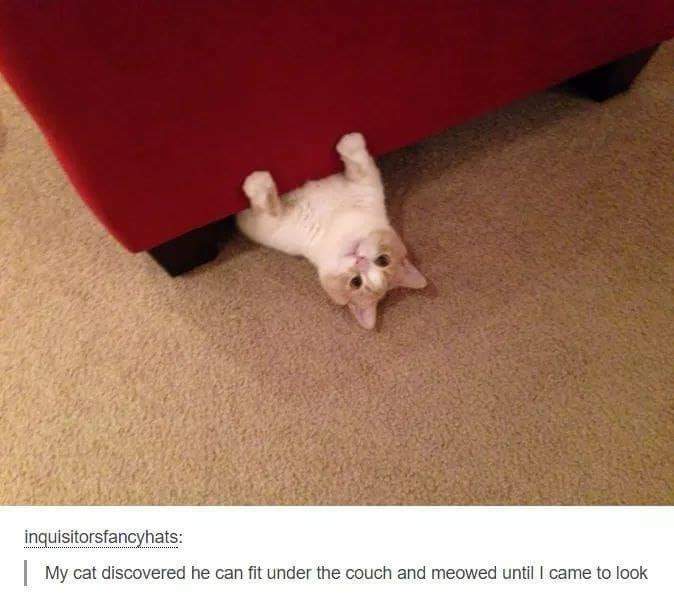 Cats don’t always make sense. They prefer to keep us guessing, I think. This is my pet black hole. No matter how hard you try to take a nice picture of your all-black cat, it will always, always come out looking like a lump of darkness with two eyes. 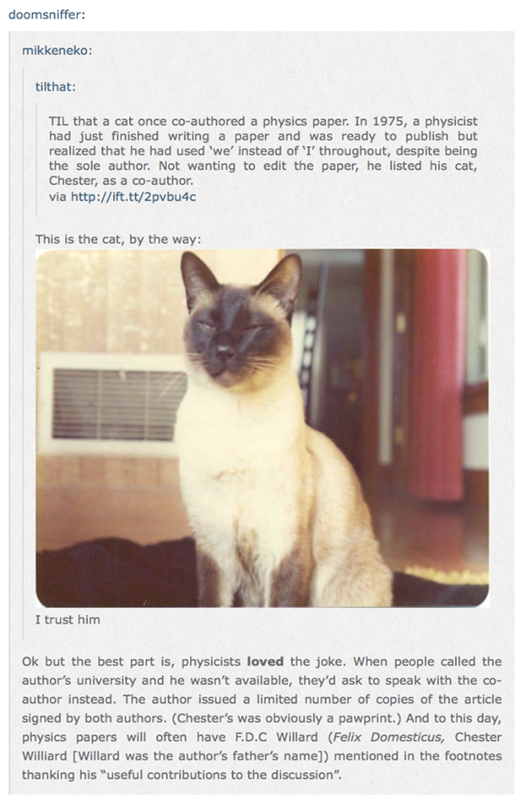 This cat co-authored a physics paper. If a dog likes you, you’re probably not a total and complete loser. 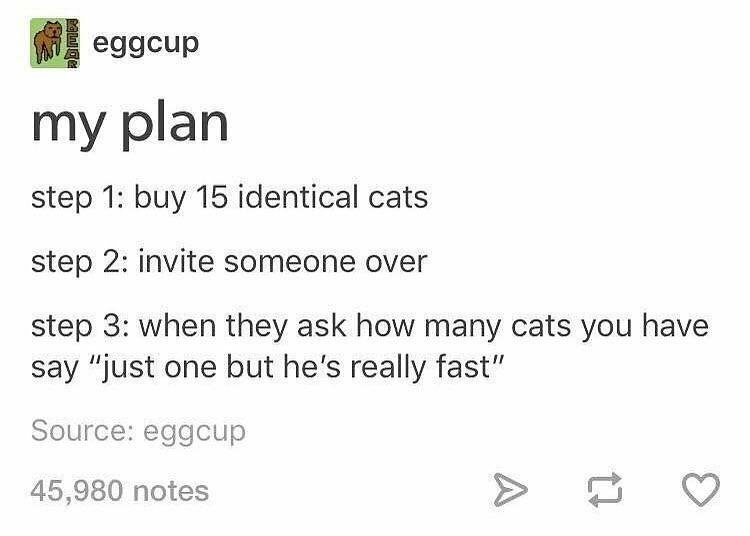 If a cat likes you? You are blessed, my friend. Truly blessed. 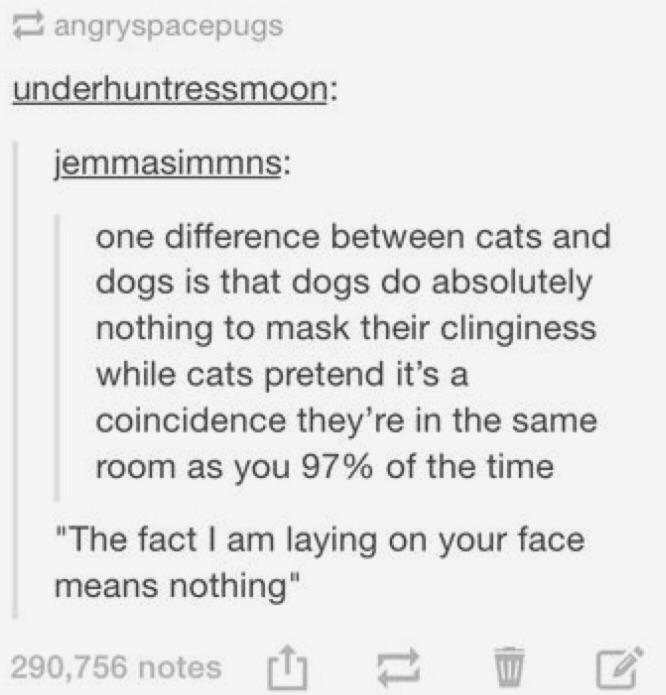 Cat ownership falls into these two categories. 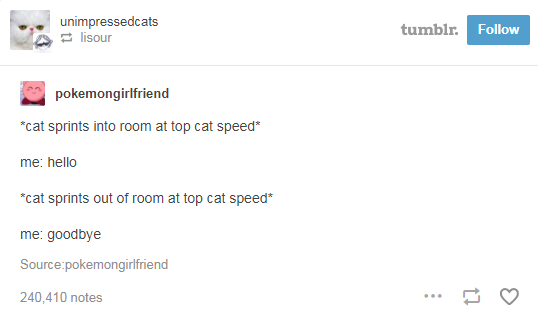 I feel like this cat could probably Physics-cat Chester a run for his money. Or maybe they could just be BFFs! 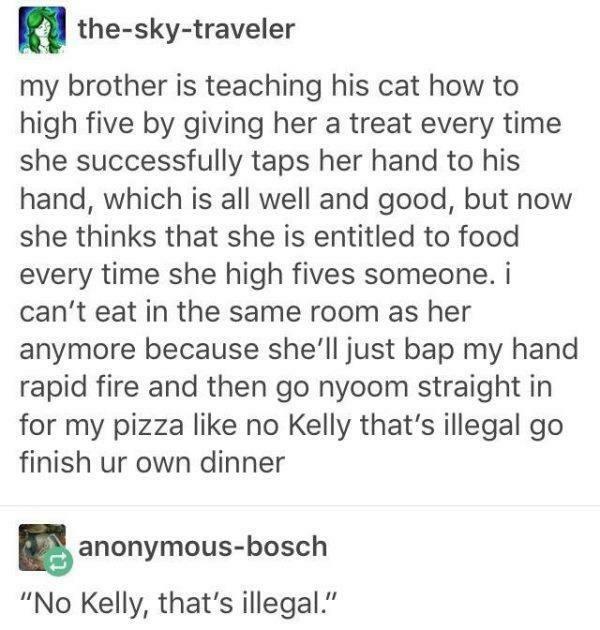 Watch out, Kelly or I’m gonna have to call the cat cops. I don’t see any way that this could end poorly. 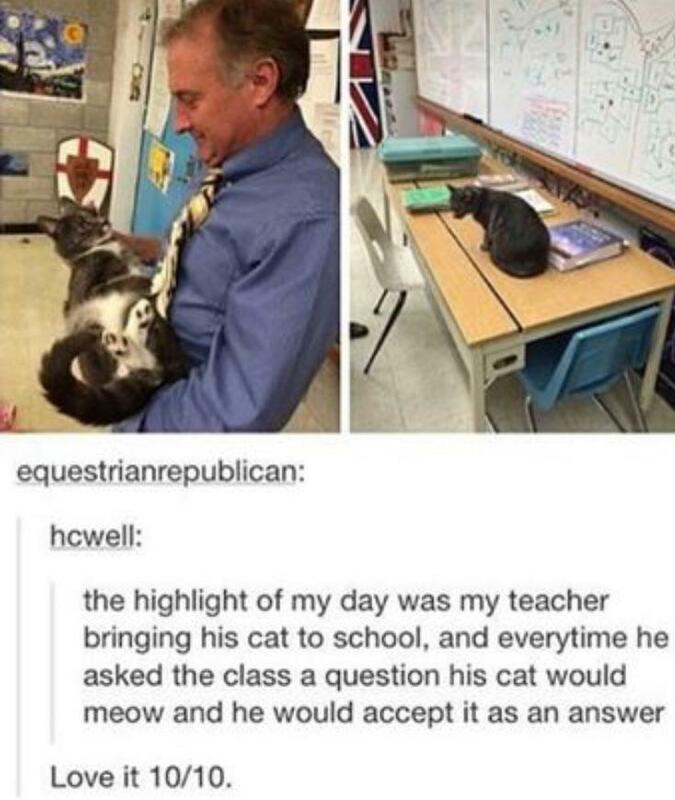 The more cats, the better! I actually kinda like Beef Wellington. Why is this so true, though? Also, what’s a gal gotta do to be best friends with a cat named Meatloaf? It’s all I want. Yes, these are the two best things in the world. 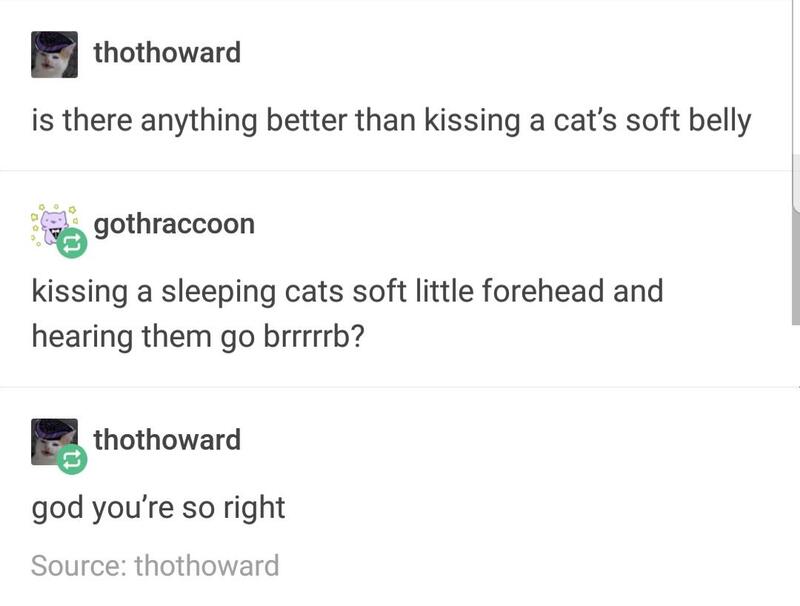 Cats have it all figured out. 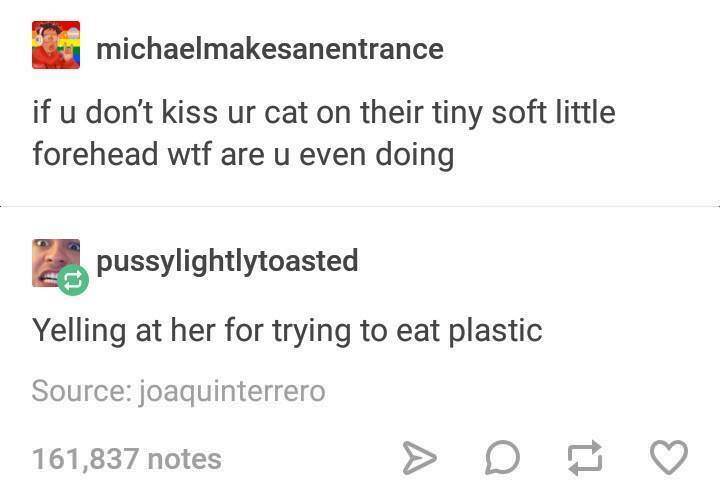 When in doubt, just think about what your cat would do, and try that. It might make some people angry, but those people probably aren’t worth your time, anyway. 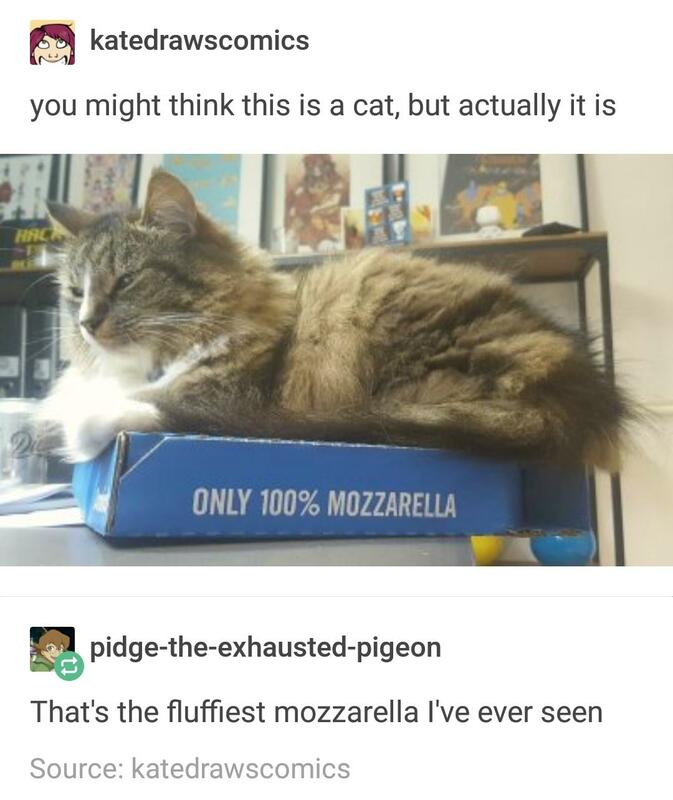 I’d like to add “Mozzarella” to the “Good food-based names for cats” list, please! Share this with your favorite cat-lover!